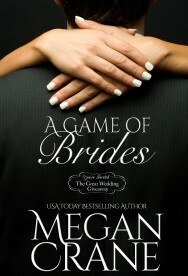 Megan's A Game of Brides was a 2015 RITA Award Nominee! Emmy Mathis is sure of three things: 1. Her sister Margery’s three-week wedding extravaganza at their grandmother’s Marietta, Montana home will be over-the-top ridiculous. 2. She’d much prefer to stay home in Atlanta in a pair of sweats. 3. And she absolutely, positively, won’t feel even a hint of a spark for Griffin Hyatt, grandson of her beloved grandmother’s best friend and the architect of the most embarrassing night of her life ten years ago. But Emmy is dead wrong about number three. The moment she and Griffin lock eyes again, the passion that’s always smoldered between them flames. And they aren’t kids any more, so why should they deny the desire that sears through them both? How can walk away from the one man she’s always loved now that she knows what she’s been missing? Monty Davison is a man on a mission: he’s determined to track down his fiancée, Risa Grant. Why did she leave Vegas so suddenly and without telling him? What was so scary about loving him that made her want to bolt? Risa Grant has found sanctuary in Marietta, Montana, and the chance to heal. She’s opened a florist’s business and is settling down to life in the pretty, friendly western town, attempting to put the trauma of past behind her. Only she can’t erase the memory of Monty, the big, handsome, protective Marine who asked her to be his wife. She left without saying goodbye, without getting the chance to tell him what had happened, and now so much water has passed under their bridge that she doesn’t know if she ever can. When Monty finally finds Risa outside Marietta one chilly April evening, stranded and needing help, his protective instinct kicks in. But a knight in shining armor seems to be the last thing that Risa wants right now, so where does that leave him? Once upon a time, Marly Akers had believed that, for better or worse, people made their own luck… Marly wonders how she could ever have believed it. 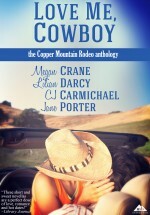 Jilted and pregnant, she’s come back to Marietta with her tail between her legs, the blow to her ego huge as she begins working at her family’s small newspaper, the Copper Mountain Courier, and sharing a tiny apartment with her disapproving mom. Things can’t get any worse. Or maybe they can. Drake Everett, who secretly captured her teenaged heart and then publicly trampled on it, decides to make her re-acquaintance. Though Drake isn’t the sharp, funny, cocky, arrogant rich boy of yore. These days he seems sharp, funny… and supportive and decent, and Marly realizes she could fall for him all over again… if she listens to her heart. But what about her reporter’s head, which has sniffed out a story that paints Drake as the sweet talker she’s always known…? She sucked in a harsh breath when Griffin jerked the wheel and brought the truck to the side of the road, coming to a spitting stop on the dirt shoulder. He threw the truck into park and then he simply reached over and hauled her to him. She had the hectic impression of those bright green eyes of his and then his mouth came down on hers, hard and sure. Last time, she’d kissed him when she’d only been kissed once before, and badly at that. Last time, she’d ended one of their typical sniping matches by simply stepping in close and setting her mouth to his, risking everything. But remembering last time was like peering at the daguerreotypes Gran Harriet collected and displayed throughout her house, because this was all color, bright and vivid and coursing through her like a flash flood. This was the sheer mastery of the way Griffin held her against his hard body and claimed her mouth. Completely. Emmy couldn’t think. She couldn’t do anything but surrender, and she loved every minute of it. She tasted whiskey and that dark, inviting thing she remembered as Griffin. She felt one of his hands at the back of her head, holding her where he wanted her as he kissed her again and again. Guiding her as she kissed him back. Making her burn. Then burn brighter. When he pulled back, he was breathing a little heavily just like she was, but he still managed to set her back in her seat with the kind of casual strength that made her feel a bit giddy.